Even with all the work I’ve put into this project over the past few years, it’s funny how seeing the cover for the first time can finally make its impending publication a reality. I absolutely love the cover and I hope you do as well. The book is still slated for a spring 2012 release and I expect that it will be available for pre-order some time soon. Thanks to all the wonderful people at the University Press of Kentucky for their continued enthusiasm and support. Click here for more information about the book. Nice cover. Overall I like it, but I don’t see anyone dead, which I would expect given the subtitle. Is this some type of political correctness? I’m looking forward to reading it. Congratulations. Kevin – Congratulations! The cover is striking and nicely done. I’m looking forward to it! Getting pumped up, months ahead of schedule! Thanks, Emmanuel. I am hoping that the photo of you arrives today from PPI. A long time in coming. I know you are pleased. I look forward to adding it to my collection. The cover looks beautiful! Congrats, Kevin! Nice cover. Thanks for sharing. My housemate wrote a number of romance novels. She really wanted to get them published. She had one that got to the point of having a cover design. Then she got to read the changes the editors had made. She pulled her book. She is a stickler for spelling and grammar. The editors had turned the book into something written by a 13 year old. I am sure this will not happen with your book. This looks great, Kevin! Congrats. Thanks, Barton. I included your name as someone who may be interested in using the book in your class. Absolutely. You can count on it. Thanks, Michael. I really appreciate the kind words. Great cover! Solid work. The appearance of both the Confederate and American flags will grab peoples’ attention. Glad you like it, Scott. 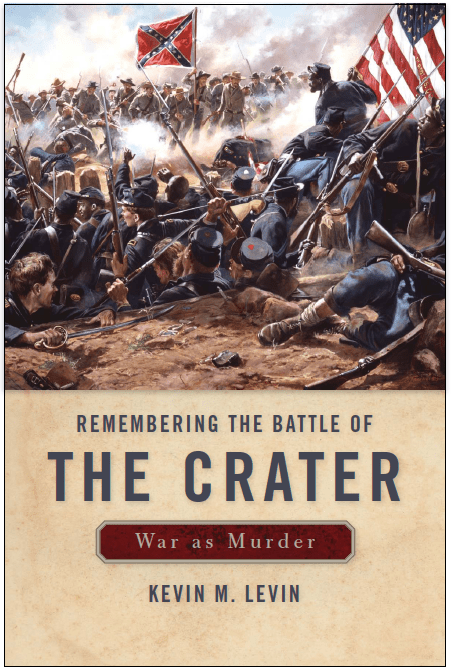 It works well alongside John Elder’s famous painting of the Crater, which is included and analyzed in the book. It’s kind of hard not “to judge a book by its cover” at times, and this is one of those times. That is a very eye-catching cover. 2012 is suddenly not that far away. Good luck with it. It may be piling on but it does look good and I’m looking forwards to reading it. Thanks, Ray. It’s nice to hear that people are looking forward to it. Many of my regular readers have been with me from the beginning and have watched it evolve over the years. Congrats! Books looks great. It is wonderful to see your name on that cover. Well done Kevin and best on your continued success! Outstanding cover!! Congratulations!!!! Looking forward to the fine read. great cover. who did the painting? Do you now own the original? I have a framed giclee edition in my library, which is meant to look like a real canvas. Only 50 were produced.